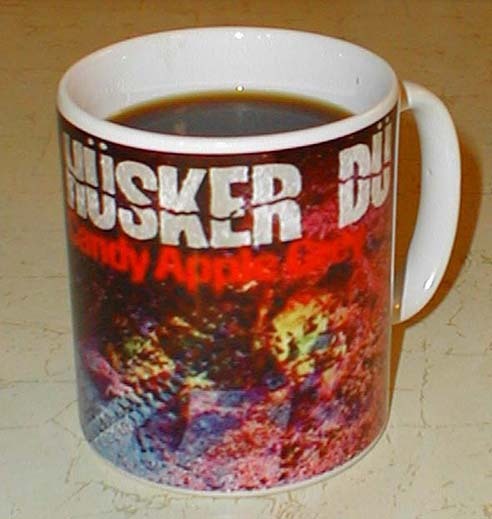 These 11-ounce ceramic mugs began showing up on eBay in Jun 2004. Multiple concurrent listings suggest a fair-sized manufacturing run, although few people actually seemed inclined to buy the thing. The seller, based in Scotland, also offered mugs for several other bands plus an odd assortment of non-music-related pop culture icons (David Beckham, Taxi Driver, Tigger). It seems fair to assume that this is not a licensed product. I can't begin to guess how such objects are created. The image is advertised as dishwasher safe and indeed does appear to be pretty permanent. The photo above is an accurate depiction of the decidedly blurry artwork. The coffee (not included) is Fair Trade Guatemala Huehuetenango, slightly overroasted by Java Tree of Manchester NH.